In this 8 ½-minute “mini” webinar, I’ll discuss burnout from the perspective of employees who have experienced it when their companies underwent transformational organizational change. But more importantly, these steps seem to be replicated even if the burnout isn’t change related. Coming up next: The REAL Costs of Burnout. Have We Lost the Ability to Say “NO” at Work? One of the biggest challenges in the modern workplace is work overload. Too much to do, too little time, not enough resources, not enough energy! Stress management techniques wisely advise that we need to take back our ability to say “no” when we recognize that we cannot do all that is expected of us. Tell that to your boss and watch what happens. We humans have limited supplies of time and energy. When we have exhausted these reserves, then our interest in related projects also eventually depletes. We may know this intuitively, but the modern workplace practically demands that we ignore our human limitations and continue to take on more work – or face the consequences. Like many of us, I can remember as a young girl that saying “no” to my parents resulted in some form of punishment – or at least “the look” and a very strong reprimand. Old habits die hard, so I shouldn’t be surprised when we continue to avoid saying “no” in order to avoid displeasing the people in our professional lives. Our loyalty to the company is questioned. We are being insubordinate to our bosses – which will not be forgotten in our annual performance reviews. The tragedy is that saying “yes” to others (especially when we don’t really want to) actually undermines our current and future relationships with that person or organization. In addition, we are much more likely to experience the negative effects of cognitive dissonance: we are acting in a way that contradicts how we really feel. This leads to anger, resentment, and burnout. Although saying “no” was grounds for punishment as a child, we are no longer children but adults whose contributions are critical in order for our companies to excel. So how can saying “no” to an assignment actually be a good thing? Saying “no” can indicate a significant lack of resources that will eventually undermine the success of the assignment. Saying “no” can reinforce the need to better delegate the workload or increase staffing (temporarily or permanently). Saying “no” can benefit customers by keeping their expectations realistic and then delivering on those expectations. Saying “no” can protect the company from litigation arising from illegal actions by employees. Saying “no” (and having that “no” accepted by management) can increase employee commitment and engagement because we are being heard and respected. Finally, saying “no” can protect the organization from negative “group think” and open the door to future innovation and creative solutions. Unfortunately, many companies view an employee’s “no” as a sign of disrespect, insubordination, and grounds for future discipline – including termination. But the fear of saying “no” ultimately does nothing to support the health of either the organization or the individual worker. Not standing up for something that you believe is wrong ensures that the unrealistic demands, disrespectful treatment, and stressful workplace will continue – for you and others. How do you create an environment in which an employee’s “no” is viewed positively? First, always consider Mehrabian’s three channels for effective interpersonal communication: 55% of meaning comes from nonverbal cues, 38% from tone of voice, and only 7% from the words themselves. Be sure that all three are in alignment. In other words, don’t say “no” using a hostile tone or defensive mannerisms. Second, provide a brief rationale for your “no.” Be sure to include a logical reason why you are refusing the request and the potential benefit to the person making that request. For example, be clear that taking on the new assignment will undermine your ability to successfully meet the deadline for another important assignment. Third, offer another option to get the work done. This may include recommending that the assignment be divided among several employees who are experts in their individual project areas so that the increased workload does not become unmanageable for any one individual. Fourth, don’t say “no” late in the game. If the project’s due date is near and you had previously agreed to the deliverable due dates, don’t “suddenly” announce that you can’t finish it. Keep all stakeholders apprised of progress and don’t be afraid to ask for help if there is any indication that the due date might not be met. It is better to modify plans, rather than never complete them. Saying “no” at work is hard and many of our past experiences have supported our belief that we should never say “no” at work. But when we can’t say “no,” we feel out of control – which is a primary factor in the debilitating downward spiral toward burnout. 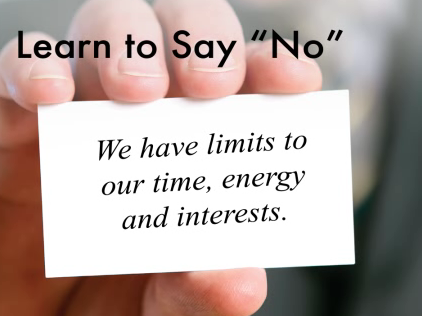 Learning to say “no” can be very empowering. It can enhance our professional relationships as well as increase the levels of mutual respect. Most importantly, it can be the first step in creating a new, more humane, and more productive way to work. Saying “no” to one thing can be the first step to saying “yes” to something much better. “There’s too much to do!!! Do more with less!!! Don’t waste time!! !” These are caveats by which many of us live our lives. For greater efficiency and financial profitability, many companies now expect their human resources to be able to multi-task in ways that are comparable to the feats made possible by artificial intelligence. Instead of harnessing technology, it has instead become our 24/7/365 master. We tend to expect that we can accomplish multiple tasks not just simultaneously, but also at the speed of our computers and mobile devices. If not, we think that there must be a problem with us. But the real problem is that many of us ignore the needs and limitations of being human. We are not wired like computers. We are not programmable robots. And that is ultimately a very good thing. The drive to not only do more with less but also to do it faster is fertile ground for our misguided attempts at multi-tasking. The primary issue is that there is often very little consideration of the nature of the tasks themselves when we multi-task: each task is simply a line item on our ever-increasing “To Do” lists. Any “time savings” or efficiencies achieved from simultaneously working on tasks that involve critical thinking or creativity are thus undermined by the reduced quality or effectiveness of our completion of each task. So, if the tasks require critical thinking, creativity, decision making, and/or learning, then we shouldn’t multi-task! Multi-tasking destroys mindfulness. We’re not totally “present” in anything that we’re doing because we are trying to simultaneously compartmentalize and control competing thoughts and goals. The likelihood of breakthrough, “a ha!” moments is severely limited. We also miss the important nuances. Since both the devil and the serendipitous discoveries are found in the details, we lose the opportunity to notice either. Finally, multi-tasking tends to draw out projects beyond the time that they should reasonably take to complete. We have a false sense of accomplishment because we completed 25% of five different projects even though we haven’t 100% completed any of them! However, there is one type of multi-tasking that I believe can be very effective. Multi-tasking via technology works precisely because it isn’t really multi-tasking. Instead, it is actually a form of technological delegation. The “grunt work” is done by technology, leaving us free to concentrate, analyze, ponder, and use our creativity to solve higher level, more complex problems. In my own life, single-tasking actually increases my productivity in terms of both efficiency and effectiveness. Maybe that’s because I’m fully focused and using all of my resources to get something 100% done. By saying “yes” to this particular project or task, I can more readily say “no” to other competing interests. What about you: is your multi-tasking propelling you toward the goals that you want to achieve OR is it undermining your path to success? Look at your past history. How effective have you really been when you tried to do too many things at the same time? Which of your key projects have you actually completed? Did the completed projects meet your expected standards? How many other projects have “fallen through the cracks” because your attention was focused elsewhere? Have any 6-month projects turned into 5-year odysseys? Of the projects that are still partially completed, how much time would it actually take to finally check this project off your “To Do” list? Are you willing to at least try single-tasking and see what happens? While everybody works differently, it is critical that we understand and appreciate the most conducive environment and tools needed for us to do our best work. Single-tasking requires prioritizing what is important – then taking the time to focus on completing the task at hand. Although it’s against the “norm” of our multi-tasking society, maybe it’s time to be a maverick and try single-tasking in order to achieve the goals and success that we really want. Can we ever stop learning? Most people would agree that we are constantly learning new things about ourselves, our environment, other people, as well as what works and what doesn’t. But how many times have you attended a mandatory training session – and been bored to tears? Or how many times have you been “forced” to learn a new method to complete a task that required you to “forget” everything that you used to do? In the 25+ years that I have been a trainer, facilitator, and keynote speaker, I have often been surprised that many of the participants really didn’t want to be there. Some displayed this through a lack of interaction. Others simply looked down and were absorbed with their smart phones. Many adopted a “wait and see” attitude as to the value of the information. Still others were blatantly hostile and combative to any new ideas that were presented. Sadly, a not large enough percentage approached the training as something enjoyable, informative, and applicable to their daily tasks, duties, and responsibilities. Fortunately, I’ve been pretty successful in giving the audience something that they could actually use. I admit that (thankfully) not all people have been resistant to learning something new. But I can’t help but wonder what past experiences jaded many attendees to fully embrace new ideas in the form of life-long learning? In corporations, a large percentage of training is required to meet regulatory compliance (e.g., sexual harssment, ethics, EEO, etc.). However, much of the other corporate-sponsored training often focuses on building key employee competencies to successfully compete in their markets. Such “competency-based performance models” are the new rage in business. “Competencies” indicate a high level of mastery or expertise in key areas of knowledge, skills, abilities, and behaviors which are then used to create a competitive advantage for the company. In other words, it’s the stuff that you’re really good at. But, identifying those competencies is a lot easier said than done. Whether or not the competencies identified by seniors leaders are actually the “real” core competencies for the company, the corresponding training always focuses on changing the tools, methods, and even reporting relationships that employees use to do their jobs. Changing the way that you work is based on a changing organizational foundation. And that’s scary for most workers. Perhaps most frightening is “un-learning” things that have led to success in the past. Can we be just as good at the new way of doing something as we were in doing it the old way? Another challenge occurs when managers don’t reinfoce the training back in the workplace – particularly if the company follows a “new is always better” approach. This occurs when company leaders are constantly changing the way that things are done…but without a sound explanation for employees as to why. Is it any wonder that employees are reluctant to put forth the effort to learn something new when the past has proven that it will just be replaced with something even newer a few months down the road? Adult learners already have insights, opinions, and assumptions about what works and what doesn’t – so we are less likely to accept new approaches at face value. Adult learners are often subject matter experts in our fields – so we want our opinions to be heard and shared. Finally, adult learners are busy – so if we are going to spend time in training (and not on something else), we want to make sure that we will be able to actually use these insights back on the job. We live in an age of constant, unrelenting change. In the book, The Fifth Discipline, Peter Senge encouraged companies to embrace life-long learning across all functional and hierarchical levels. In a world that is constantly changing, the only way to adapt is by being open to learning new ways to approach both new and old problems. Notice that “learning” corresponds with “change.” Given the high degree of change resistance in many organizations, it is not surprising that these fears will be most noticeable in employee reactions to training and development. Ego plays an important role in the unwillingness to abandon old beliefs and replace them with something which is currently unknown. Economic realities threaten our feelings of security when we aren’t initially “good” at something new because we fear that we are now “replaceable” in the organization. In today’s time-strapped workplace, there is often an expedited learning curve that just isn’t conducive to learning and then implementing higher level, complex ideas. It’s just easier to continue to do things the old way. 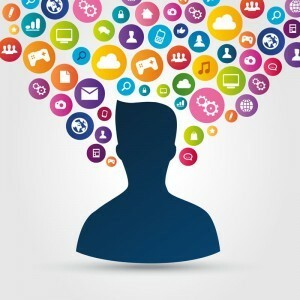 Information overload is a genuine problem affecting worker productivity and organizational performance. Exhaustion and fatigue coupled with misguided attempts to multitask cause us to shut down to new ideas. There is simply too much to learn and do. We are overwhelmed. Learning inherently questions the status quo in order to create something that is more efficient, effective, and powerful. This is a double-edged sword for many senior organizational leaders. An informed workforce is like the child who isn’t afraid to say that the emperor isn’t actually wearing any new clothes: employees can and will challenge organizational leaders and the decisions that they make. Moving toward a commitment to life-long learning is therefore a major paradigm shift for both the organization as a whole and the individual workers within it. But fearing new ideas and stubbornly refusing to at least try them is a prescription for failure in a constantly changing world. As humans, we are hardwired to want to understand and know more about ourselves and our environments. Many times we will fail in our first attempts to try something new – but that shouldn’t prevent us from continuing to move forward. This is perhaps the greatest advice from Senge’s Fifth Discipline: failure is nothing more than an opportunity to learn. In my consulting practice, keynotes, and training sessions, I have consistently recommended that business professionals need to become more curious. 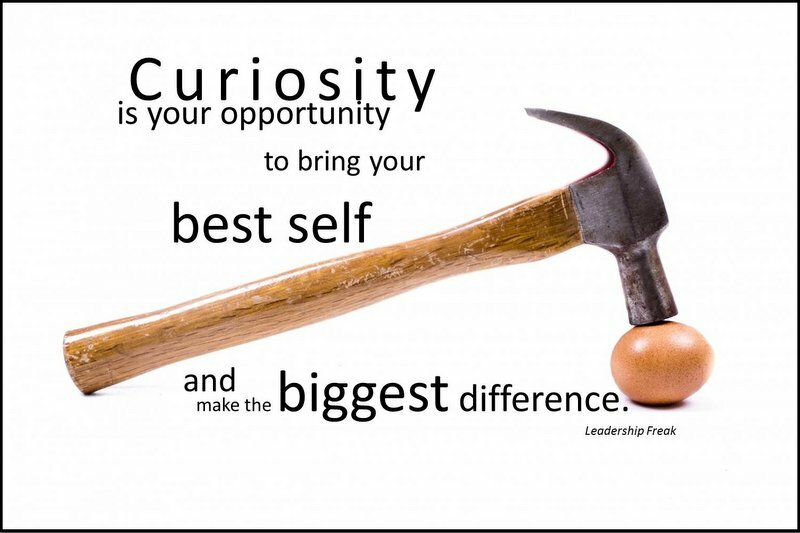 In fact, I often recommend a megadose of curiosity in order to solve problems and make better informed decisions. Curious, creative people tend to ask more questions, investigate more thoroughly, and are not afraid to “play” in order to come up with new ideas, innovations, and solutions. Then why do so many creative people fail to turn their dreams into reality? Are we focusing on the wrong things? Recently, I began reading a fascinating book, The Power of Noticing by Max Bazerman. While we’ve all been encouraged to analyze the internal and external factors that can contribute to the success or failure of any given action, the idea of simply noticing is often overlooked in decision making. As a university professor, I’m often amazed at how many of my colleagues are fantastic at delving into minute details – but missing the “big picture.” In academia and business, many people unfortunately remain in their area of expertise and ignore anything that is not related to their field of interest. Although specialization has long been an important consideration for a job-related promotion, there has been an urgent need for business professionals to also have at least a rudimentary understanding of how their particular job fits in with all the other jobs in the organization. There is a tendency to become complacent when it is assumed that we already know the key factors in a situation – at least in terms of how they relate to us. In our minds, it is just logical that we focus on those important elements and ignore the rest – somebody else will focus on them, right? The current trend is toward harnessing “big data.” As I’ve noted in many of my blog posts, “big data” is critical in business and can be a powerful tool to help move a company up to the next level – but it is only part of the picture. Focusing exclusively on the “data” (without noticing any factors outside that data) skews both the information and ultimate decisions arising from that data. Bazerman’s book addresses these issues head on and challenges us to actively notice what is going on around us. The book, however, is not a fluffy, “here’s how to heal your relationships” kind of book. Instead, it looks at major failures that led to loss of revenue, reputation, and, more importantly, loss of life (such as in 9/11 and the Challenger space shuttle disaster). The goal, of course, is to help our foresight (not just our hindsight) become 20/20. We all have blind spots in how we take in and observe information – it’s part of the way our brains are wired. This short, classic video simply asks you to count the number of passes made by the basketball team in white. If you watched these two videos, then you might have been surprised at something so “obvious” that you didn’t notice. Thinking inside the box means that we are following the instructions given to us. We’ve been taught to block out anything that is not related to the subject or object of our focus because it is “irrelevant.” But this tunnel vision actually skews our ability to see what is really happening. Noticing, therefore, is more than just observing. I agree with Bazerman that the ability to really notice is often underrepresented in modern business. Whether we ignore these insights from ignorance, arrogance, or a focus on the bottom line is debatable. But what is not debatable is that not noticing can lead to horrific consequences that could have been avoided. How aware are you really of what is going on around you? Do you notice certain things – then dismiss them because you assume that they are not relevant to you? What assumptions are skewing your ability to be curious and notice? Isn’t it time for you to take the notes of the signs that you might have been missing? 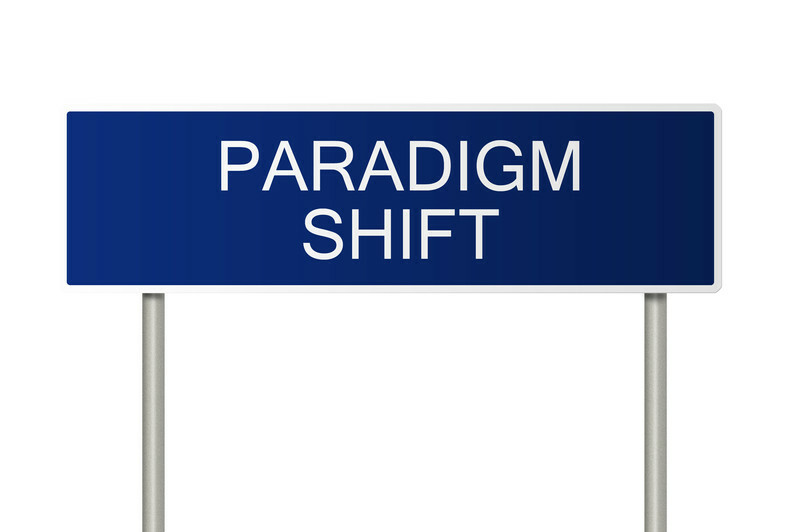 A few weeks ago, I posted Paradigm Shifter #30: Believe what people do (not what they say). In that post, I mentioned that people’s actions are the only true reflection of their real priorities. It’s just as true a reflection of you. Today’s hyperactive pace often leads to many of us doing things because we think that we have to – even if they aren’t necessarily aligned with what we say is important to us. But actions do speak louder than words. Priorities are not the mind-numbing “to do” lists. Nor are they the “have to’s” that other people demand of us. Instead, priorities reflect our values, beliefs, and (when acted upon) our dreams, goals, and aspirations. Life is short and, without priorities, we tend to flounder and may never attain whatever it is that we deeply want. When I was 27 years old, my mother was diagnosed with terminal cancer. Two months later, Nana (my grandmother who lived with my family from the time I was a little girl) died. Fifteen months later, my mother succumbed to cancer; she was not even 60 years old. Life is many-faceted – all of which are clamoring for our attention. We have the opportunity to choose at any given moment what is a priority and consequently on what we will focus our attention. I chose not to be the workaholic business owner who never had time for friends or family. I recognized that there usually always is another day – but that each moment is precious and should not be squandered. What I choose to spend my time on in any given moment is a blatant reflection of what is important to me at that time. Furthermore, if everything is important, then nothing is truly a priority – prioritization necessarily characterizes some things as more important than others. Finally, the unique way in which we balance all these activities and situations is reflective of what we truly believe is important and worthwhile. I would love to say that this perceptual shift was met with great enthusiasm and support by those around me. It wasn’t. Probably because when you say “yes” to one thing, you inevitably have to say “no” to something (or someone) else. Because people change, it also means that people’s priorities will also change. Sometimes they will still be in sync, but, other times, they may actually be counterproductive. It takes courage to define exactly what it is that you want in your life…but it is only the first step. The much more difficult challenge is to choose on what you will spend your time: minute by minute, hour by hour, week by week, year by year. A basic law of physics states that nothing is motionless: so if you’re not moving forward, then you’re moving backward. The biggest regrets that I’ve observed in family, friends, colleagues, and clients relate to never finding the time to do what it is that they say they really want to do. Although it sounds cliché, we can’t please everyone – but, at the end of the day, we can please ourselves. Earl Nightingale is often quoted as saying, “You are what you think about.” What you think about is the catalyst for what you will act upon. And what you act upon reflects your innermost decisions about what you believe is important in every moment. Living your life by the priorities that you set for yourself is not just a guarantee that you will continue moving forward (despite the obstacles) on your path to the goal. The added bonus? The chance for regrets about “woulda, coulda, shoulda” is almost nil.